Copyright 2004 (retouched in 2014), Pam England, All Rights Reserved. Birth customs reflect whatever a culture has faith in at the time. 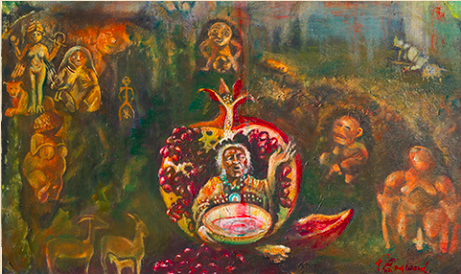 The lower third of this painting depicts buried matriarchal spirituality and culture. The Great Mother, ensconced in a pomegranate (a symbol of fertility) represents ancient knowing and compassion. She hears the cries of birthing women even as she is calling to all women—including women who have medical and surgical births. She is holding a large bowl, collecting the tears, amniotic fluid, and blood of birthing women. Buried in the earth and our collective memory are the primordial images of Inanna (Sumer), Venus of Willendorf (France), Mother and child (Peru), Sheela-na-gig (Celtic England/Ireland). the Mexican moon goddess Tiazolteotle, and the Great Mother of Çatal Hûjûk (Turkey). Those interested in using art for the purpose of visualizing birth can utilize this panel. Focusing on all of the powerful birth figures mentioned above, the pregnant viewer does not feel isolated as she prepares for her own experiences of labor and birth, instead sensing a connection to the tradition of birth and to the many women who have given birth before her. This connection to others calms the mind as one prepares for birth. 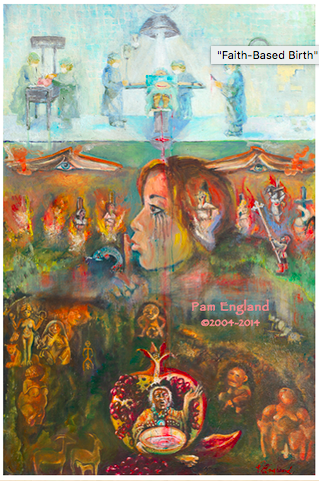 Pam England, MA, CNM, is a home birth midwife, mother, writer and artist. She has written and presented prolifically on the topic of birth, as well as on how spirituality and art are often part of birth as a rite of passage. Pam may be contacted through her website, Birthing from Within, named after her foundational book of the same name. The center panel shows the Inquisition (1400-1700), when untold thousands of women, including midwives, and healers were tortured, burned alive, or drowned by men of the Church. To survive, women made a tacit agreement to be silent and compliant. Centuries later, having never grieved the first war on women, we are still living this unconscious agreement in birth.